Two years ago, I realized I was sitting quite a bit. At work, at home, in the car and in meetings. Even I, a chiropractor, had neck pain and headaches from poor seated posture. I started to grow frustrated that I was sitting even in my home office, while finishing notes and responding to emails in the evenings. So I decided to find a quick solution. I gathered old milk crates, a couple of planks of wood, and fashioned my own standing desk right in my house. It was not a pretty sight, almost resembling an old college dorm room. But it got me out of my chair, which I considered a success. Then I started to research standing desks online. Disappointed with both the high prices and clunky designs I found, I set out to build my own. That quest led me to Ikea, where I purchased the following items to build two standing desks, one for me and one for my wife. We completed the project in one day. Want to make your own? You can! Here is what I bought and what I did. Cut two 42 inch sections of butcher block with a circular saw or table saw. Sand all pieces of butcher block. Apply tung oil, polyurethane, or finish of your choice. Mount four Gerton Legs on each individual section of butcher block. Mount four Capita Legs to each monitor stand piece. Adjust Gerton Legs to the appropriate length. Place monitor shelf on top. Voilà! 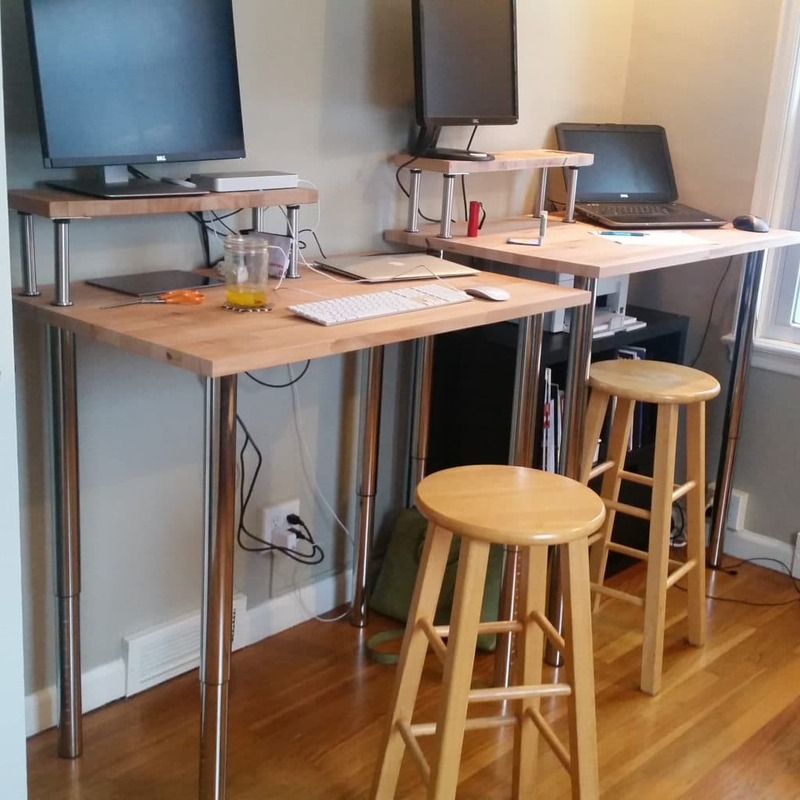 You have your very own butcher block standing desk! Now, what can you do to modify your work desk? Or if you don’t want to build your own desk? 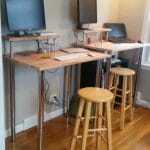 Consider purchasing an adapatable workstation that can convert any existing desk into a transitional standing desk. Check out this great Lorell Desk that we purchased locally from Storey Kenworthy. But my feet get tired! What happens when your feet get tired? We found this great review from TheWireCutter on the best standing desk mat. And we agree – it’s great. Our office manager, Jen Morrow, loves it! 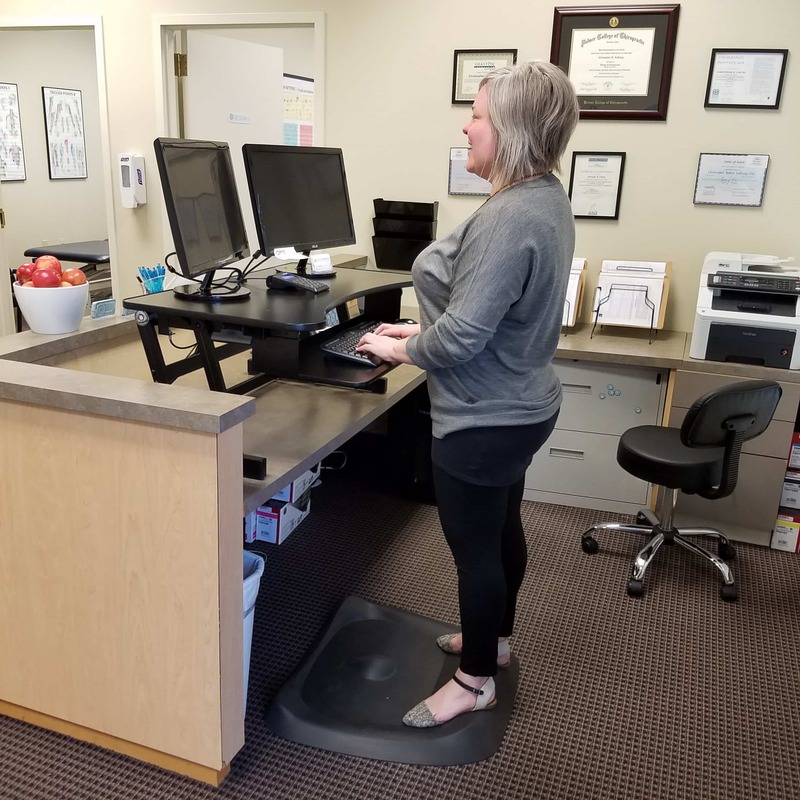 We often encourage patients to investigate standing desk options and to seek assistance from their employer, especially when back pain, neck pain and headache symptoms could improve faster with the addition of a sit-to-stand desk. 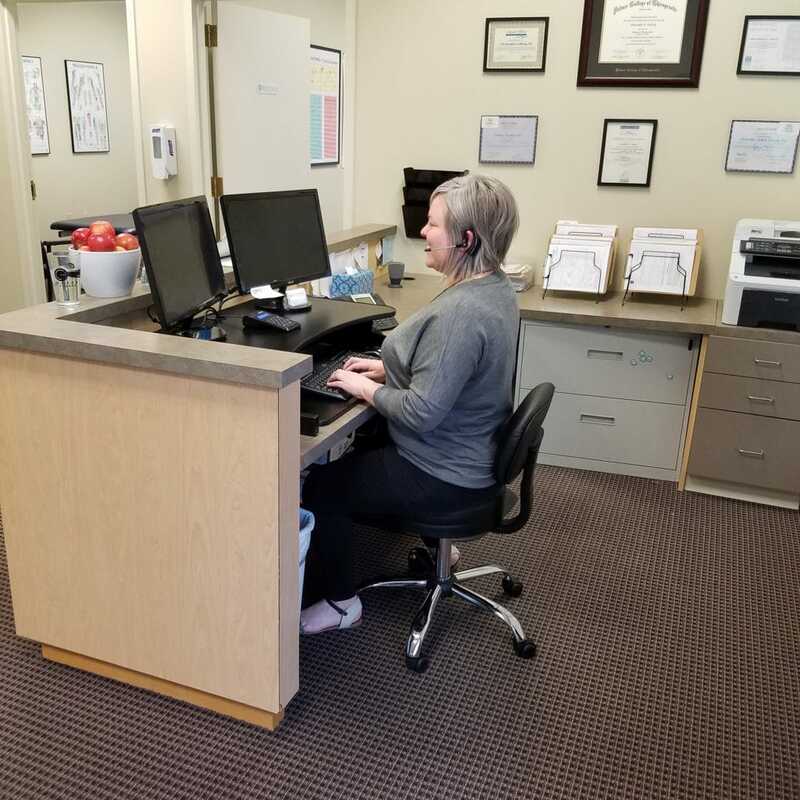 “Our findings support the hypothesis that chronic LBP might be improved by the introduction of a [Sit to Stand Workstation] in an office environment.” – Ognibene, Grant T. BA, et al. Interested in more articles about the health effects of sitting?